Two Iranian warships set sail today for the Atlantic Ocean on Iranian navy's first-ever mission there. The voyage comes amid an ongoing push by Iran to demonstrate the ability to project power across the Middle East and beyond. The frigate Sabalan and the replenishment ship Kharq are dispatched on a three-month voyage. 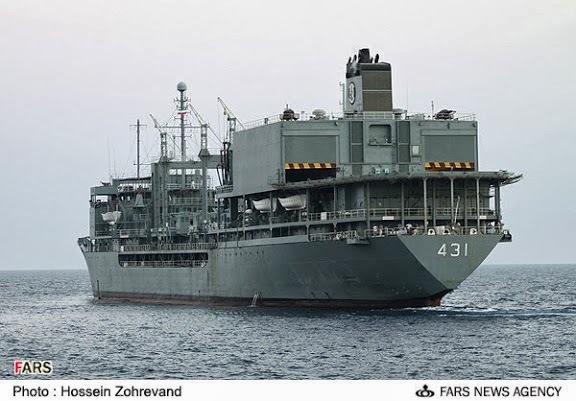 The ships, carrying some 30 naval academy cadets for training along with their regular crews, left the southern Iranian port of Bandar Abbas today. The navy did not disclose any ports of call. Iran has regularly deployed warships to the Gulf of Aden off the eastern coast of Africa to fight piracy and protect commercial ships. Photos: IRINS Sabalan (73) Alvand class (Vosper Mk5 type) frigate, and IRINS Kharq (431) Kharq (modified OL) class replenishment ship. At least they are gaining valuable training and experience. Will be interesting to see where they travel to, past Gibraltar. They have to peridically check an accessibility of the Suez Canal and other passages, and bring some "goods" from friendly countries. And at this period of time, they may join the Russian Mediterranean naval task force, which is about to be joined by the Russian aircraft carrier, with its five escorts, to project show of strenght, close to Syria's coastline. Like it was informed earlier, Russian nuclear powered heavy cruiser, Pyotr Velyky, is in the command of the Russian naval task force, which has been operating in the eastern part of the Mediterranean Sea. By information of the Russian DM, nuclear powered submarines will joint their task force in that area, in the 2014. 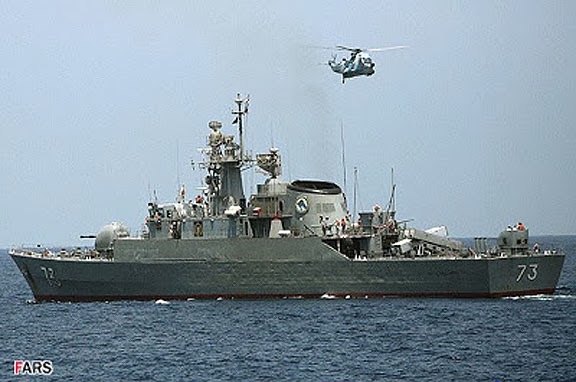 The Kharg, with its helicopters, is able to provide connections with a land in neighbouring countries and with the Russian navy's vessels. Hilarious comment from you, that contributes nothing and has no relevance. Mark, do they need to go via the Gibraltar? Can’t they go directly to South Atlantic? They didn’t specifically say they were sailing to North Atlantic. Those shaky little Mullah boys can go to the Atlantic and sail in circles all day in those rust buckets, if they so wish. But they better not enter our backyard, the Mexican Gulf or anywhere close to our shores!!! So there was no point in Anonymous January 22, 2014 at 8:24 AM starting such comments. The deployment to South Africa is part of a series of IRIN's cadet cruises that had been going on for 5-6 years. As part of the program during this period, the IRIN has deployed ships, with cadets on board for training in addition to the regular crew, to China, Sri Lanka, India, Syria and the GCC countries. Anon 7:20 AM.......I can write what ever reasonable comment on Uskowi. If you don't like that go and read one of those comics they print in the unholy republic. Silly comment made by someone that hasn't a damn clue as regards the true condition and size of the Iranian navy as compared to a large and advanced navy such as the US. You can't compare the power of a mouse to an elephant. In the unlikely event of war between Iran and US,the Iranian navy in the Atlantic and anywhere else in the world will be sunk in a few hours. The regime is using this cheap stunt as propaganda for domestic consumption. Yes,theres nothing quite like the smell of good old western hypocrisy and double standards especially when it comes to the middle east,but the people like gurney have never had any problems with that,when it comes to the myth of western exceptionalism or "do as we say not as we do" hes a true believer,right gurney? In the unlikely event of war the US navy will not have its major assets lined up in the persian gulf so that Islamic republic can have a easy shot at them. Even if Iranian navy sinks a ship or two,the US response would be finale and devastating. Once again you're comparing the power of a mouse to an mighty elephant. You can write and still not contribute anything of any relevance. If what I write is of no "relevance" then why are you getting your knickers into a twist? Anonymous January 25, 2014 at 1:10 PM, continuing to write and still not contribute anything of any relevance. Thanks for proving the point!